Correspondence relating to the Southern Division and independent companies of the Kansas Militia. Includes commissions issued by Colonel George W. Johnson of the 2nd Regiment for William F. Donaldson, John Riffel, George H. Cole, William J. Preston, John Shannon, Dr. B.C. Brooke, and others. Commissions were also issued for members of the Lecompton Riflemen, the Tustunuggee Mounted Rifles, and the Fort Scott Mounted Riflemen. 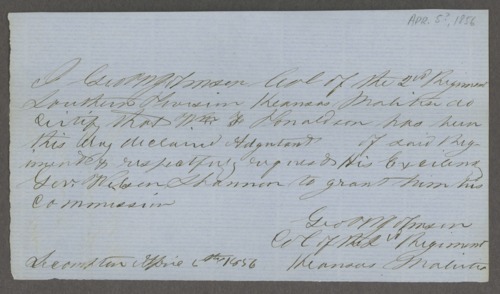 Other correspondence includes orders from Governor Daniel Woodson to Major General Asbury M. Coffey in August 1856, the correspondence of Henry T. Titus and William A. Heiskell with Governor John W. Geary, and a petition from Captain John Donaldson of Company A, 2nd Regiment asking Governor Geary that his company be honorably discharged.